After a few days in Boulder, a friend and I drive back to Minnesota. We stop at Mt. Rushmore (major tourist trap) and the Badlands (much more impressive than I expect, as can be seen in the photo) along the way. The Black Hills forest in South Dakota is pleasant, and amusing: state highway signs here, in an almost threatening way, say "Wild Animals at Large"). Most of Wyoming and Dakota, though, are very flat and uninteresting areas. The state was formerly dominated by the proud and mighty Sioux Indians. Today, most decedents live on nine reservations in the state. Many settlers came as a result of the free land offer by the Homestead Act of 1862. 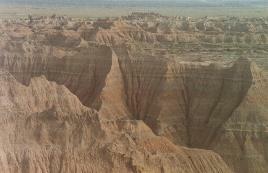 The Badlands are a colorful and spectacular result of eons of erosion. Statehood came in 1889. In 1994, 721,000 people lived in the state.